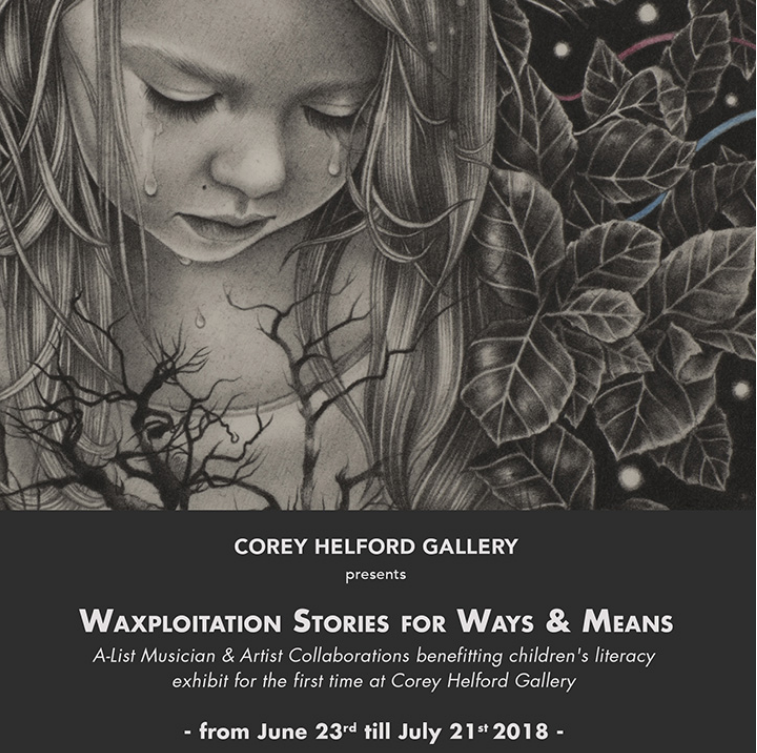 Corey Helford Gallery presents a special exhibit, Waxploitation Stories For Ways & Means, opening Saturday, June 23 in Gallery Three. Co-curated by Caro Buermann and Waxploitation Records founder Jeff Antebi, this is the companion exhibition of the children’s benefit book project of the same name: a 350 page coffee table art book with short stories written by world famous musicians such as Tom Waits, Nick Cave, Frank Black, Devendra Banhart, among others, accompanied by original art by living legends such as Anthony Lister, Dan Baldwin, Swoon, Will Barras, James Jean, Ronzo, Kai & Sunny, and many more. A portion of proceeds from both the book project and the art show will benefit Room to Read, 826 National, Pencils of Promise, and War Child. The exhibit features over two dozen drawings, paintings and illustrations from the book. Released in 2016, Stories For Ways & Means is ten years in the making, and also includes animated short films featuring narration from Zach Galifianakis, Danny Devito, Nick Offerman, and more.